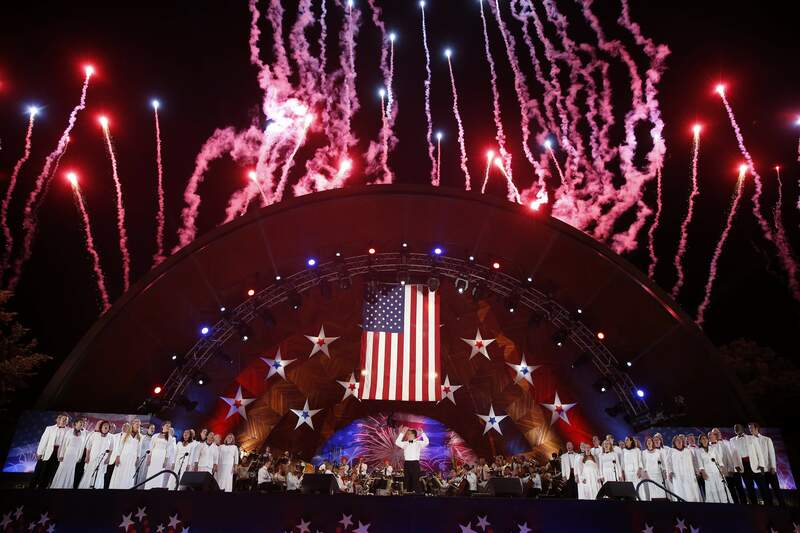 BOSTON - The annual Boston Pops Fourth of July outdoor concert and fireworks show, one of the city's signature events, has been moved up a day because of potential heavy rain ahead of Hurricane Arthur. The celebration is being rescheduled for Thursday, to what appears to be the better of two potential bad weather days, organizers and public safety officials said Wednesday. The performance takes place in the Hatch Shell along the Charles River Esplanade, with fireworks set off from barges on the river. Hundreds of thousands of people usually attend. "It's not optimal. We wish it were, but we've got to deal with this," state police Col. Timothy Alben said. He said security arrangements are ready, because the public final rehearsal would have been held Thursday night anyway. Alben said officials recognize that afternoon road closings ahead of the show will affect traffic on a work day. People were urged to use public transportation. Alben said the performance could be canceled Thursday if the weather isn't safe. Because of performer contracts, Alben said the concert cannot be pushed to Saturday. However, he said the fireworks show perhaps could be. If the celebration takes place Thursday, the fireworks display will be streamed live for the first time starting at 8 p.m. on CBS Boston. The webcast also will be available for 24 days on demand at the Boston Pops website. The concert has been delayed in the past because of threatening weather during a performance, and the fireworks have been rescheduled. Arthur is forecast to pass well east of New England beginning Friday night. Moisture bands ahead of the storm are expected to bring rain and thunderstorms. Other Massachusetts communities also have rescheduled fireworks shows because of the weather.